Sunday February 12th. myself and Lenny decided it was time our new boat was taken out for her maiden voyage. 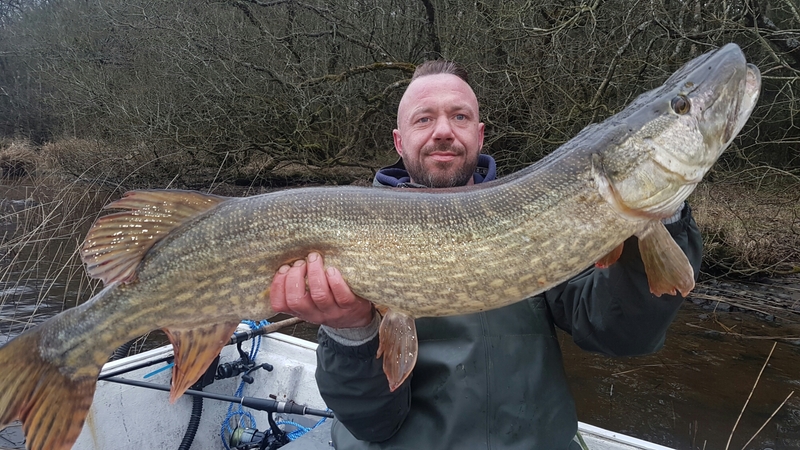 Some pike fishing on the river was an ideal opportunity to try her out. We were joined by our good friends, Lloyd and Chucky and my cousin Séanie, who only found the joys of fishing a couple of months ago. Lenny, Séanie and myself on our boat, with Chucky and Lloyd on theirs. We had no idea what the day had in store for us. Things couldn’t have started any better. We three arrived a bit later than usual, having towed the boat from Wexford. On arrival we could see Lloyd and Chucky had a couple of rods out while waiting for us. Although it was still dark, we noticed the two lads grinning from ear to ear. We’ve already had 2 said Chucky, a low double for me, then he looked at Lloyd smiling again. Lloyd said, have a look in the sling in the river there lads. As I walked over my eyes nearly popped out of my head. I could see the frame of a huge fish resting in the sling in the shallows. That’s some lump boys, I said, thinking it could be close to his pb of 25.5lb, did you weigh her pal? I did, said Lloyd, a new pb, 26lb on the nose. 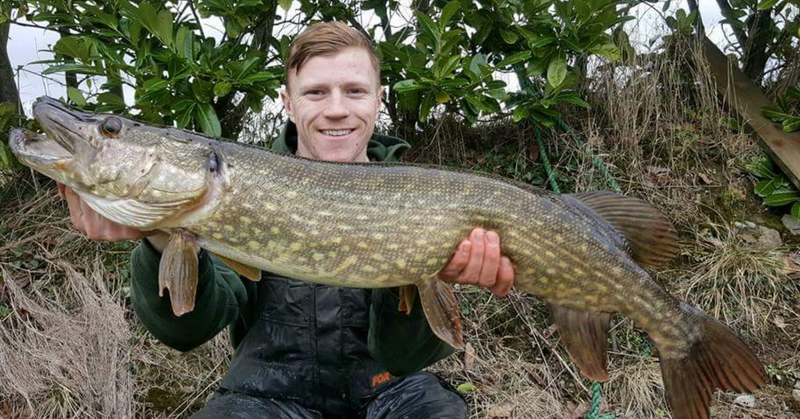 Amazingly, his 11th pike of 20lb+ this season. He took her out of the sling and held her lovingly. What an absolute cracker she was. After a few snaps, she was quickly released. 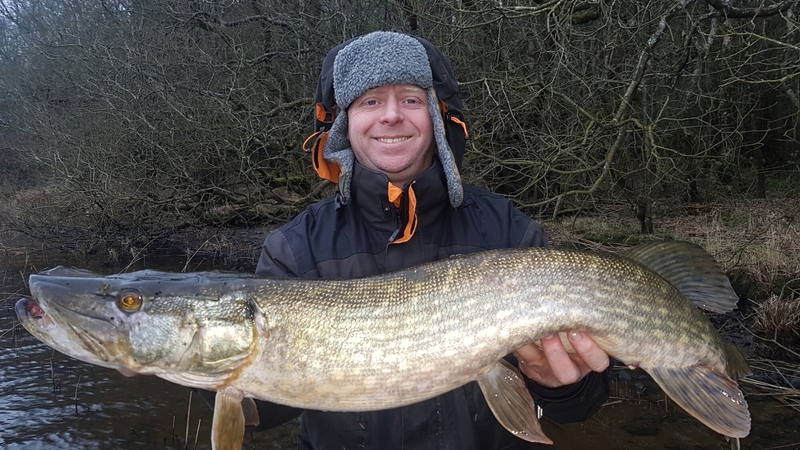 This amazing rodman’s 20th fish over 20lb. 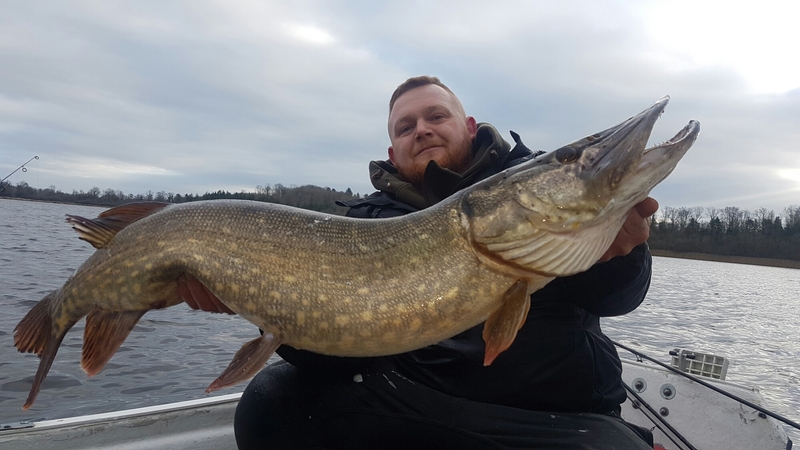 We quickly set up our rods and got the boat launched, buzzing with the excitement of seeing such a monster so early. It wasn’t long before I was in to my first fish, doesn’t feel that big, says I. As she came close, she must have spotted the boat because, off she went on a rod bending run. A couple more runs and Lenny had her netted for me. What were you talking about, not that big Says Lenny, she’s another bleedin’ cracker! When I had a good look, I thought she was another 20, surprisingly she topped out at 19lb 6oz. Still a very healthy lump, with a massive spawn filled belly. I unhooked her carefully, put her gently in the sling to catch her breath and after a few snaps, she was quickly released. During the next couple of hours, everyone but Séanie had a few more jacks. Needless to say, he was getting a fair bit of stick for this. Listen boys, said Séanie, I’ve never blanked, not once on any of my previous trips. The weather took a turn for the worse. Bit of a gale started blowing, then a few showers of hail, rain and snow. Chucky and Lloyd decided to head in for a spot of bank fishing in a quiet sheltered little bay, they had spotted from their boat. We three bravehearts decided to persevere, just moving around from one spot to another. We had a quiet couple of hours, but the banksmen were still getting plenty of action. About 3 o’clock, that all changed. First Lenny with a brace of nice doubles, 11 and 13lb and a few jacks for myself. Séanie’s rod, baited with a mackerel tail, took off. I knew it was a good fish when I saw the bend in his rod. The fight went on for about 7 long minutes before Lenny managed to get the net under her. Séanie turned to me and said, that’s a 20 cuz isn’t it? It most definitely is, said I.
I told you I never blank, he said, with a grin spread all over his face. 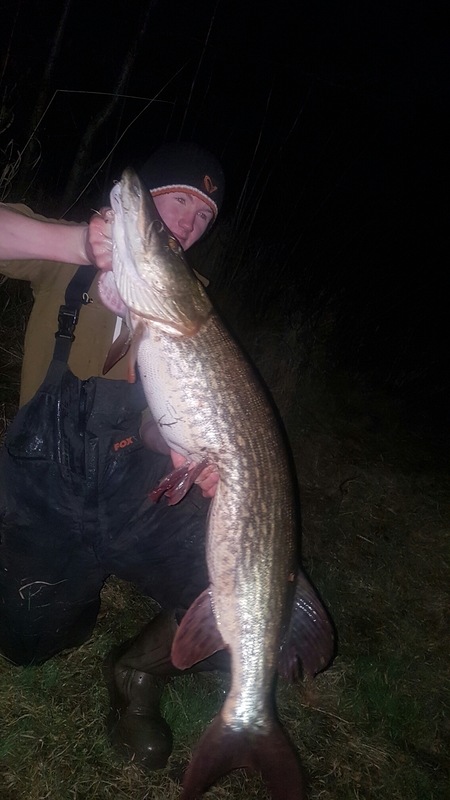 23lb. 8oz., what a fish and the man only fishing for a couple of months. 2 new personal bests in one day, we phoned the lads to tell them and to see how they were getting on. They said they couldn’t keep their rods in the water all day it was that good. Chucky with a couple of lovely doubles, topping out at 15lb. with plenty of jacks and Lloyd doing what he’s best at. Fish after fish topping out at 16.5lb., the best since they left us. I can honestly say it was the best days fishing I’ve had in many a year. A day none of us will forget in a hurry. 9 fish for our boat and 25 for Lloyd and Chucky. 15 of them doubles, with 2 in the 20+ bracket. It’s days like this that make all the freezing toes & fingers and all the blanks worthwhile. What a great way to christen the new boat. There’s not much of the season left, but rest assured we’ll be out there trying to get a 30 pounder and if it’s not this season, there are plenty more to come. All the best and tight lines till next time.